'This Is Going To Be Absolutely Heart-Wrenching': The Thousand Oaks Shooting Victims The identities of the victims have been confirmed in tearful interviews or statements by family members, friends and colleagues. Among them are nine men and three women. They range from 18 to 54. On some of the more popular nights at the country music dance hall, the crowd inside could be counted on to be in the hundreds. The patrons could be counted on to be wearing plaid, boots, cowboy hats, and — if they were women — short shorts. What could not be counted on was that a gunman, armed with a Glock 21 .45-caliber handgun, would begin indiscriminately firing into those throngs of happy people. Authorities have not released many of the victims' names, but among those who have been confirmed are nine men and three women. Their ages range from 18 to 54 — a reflection of the crowd drawn to the "College Country Night" at the bar. Sgt. Ron Helus, 54, was among the first law enforcement officers to respond to reports of a shooting. He died at a hospital from injuries sustained during a confrontation with the shooter hours earlier. This undated photo provided by former Fox News correspondent Adam Housley and his wife, actress Tamera Mowry-Housley, shows their niece, Alaina Housley, a Pepperdine University freshman who was among those killed in the Wednesday shooting at the Borderline Bar & Grill in Thousand Oaks, Calif.
"According to numerous witness accounts, Justin died a HERO saving many lives with no regard for his own life," Meek's mother, Laura Meek, wrote on Facebook, according to the newspaper. Daniel Manrique was a native of Thousand Oaks and had served in Afghanistan with the Marine Corps, Task & Purpose reported. He became an active member of the veterans community in Los Angeles upon his return. After leaving the service, he worked for an LA nonprofit that helped provide financial-planning assistance for veterans with mental health diagnoses. Telemachus "Tel" Orfanos, 27, survived the deadly shooting last year at a country music festival in Las Vegas. "How ironic right, that my son who is a survivor of Las Vegas and was a bit of a gun enthusiast should be killed this way," Marc Orfanos, Telemachus' father, tells NPR's Leila Fadel. He said Telemachus was a country music lover. It was the reason he was at the music festival in Las Vegas and why he was at the bar on Wednesday night. Telemachus was a U.S. Navy veteran who was often referred to by his nickname, "Tel." He loved line-dancing at the Borderline Bar & Grill. His father said that until gun violence is treated like an epidemic, mass shootings will continue to happen. "When you have 300 million guns in private hands, more guns than you have in places like Yemen or Syria, there is something seriously wrong," he tells Leila. Susan Schmidt-Orfanos, Telemachus' mother, also called for stricter gun measures in a video uploaded to Twitter by ABC7. "She was a beautiful soul, I am so thankful for the times she was in my life, especially at my wedding this past October," said Bre Breck, a relative of Sparks, in another Facebook post. 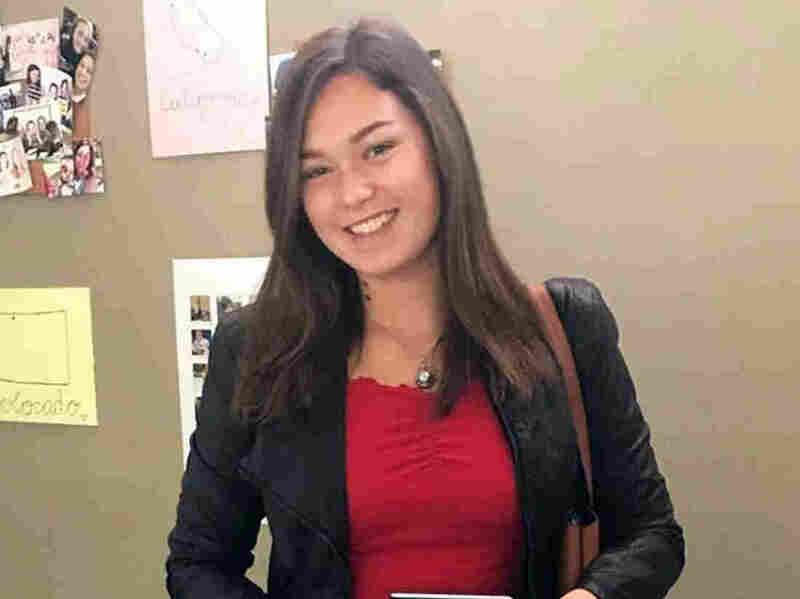 Morisette, who lived in Simi Valley, was working at the bar's front desk when the gunman walked in and started firing, Thousand Oaks Acorn editor, Kyle Jorrey reported on Twitter. "We didn't want her life to end, but we don't want her memories now to end, either," Martha Morisette told The Baltimore Sun. Marky Meza Jr., 20, was less than two weeks shy of his 21st birthday later this month, his family told KEYT-TV. He was working as a busboy and food runner at the Borderline Bar & Grill when he was shot and killed. "Marky was a loving and wonderful young man who was full of life and ambition," his family said in a statement, adding that they are devasated by his loss. His Facebook page indicates Meza lived in Carpenteria, Calif., and that he'd studied photography at Santa Barbara City College. Blake Dingman, pictured carrying his brother, was passionate about "cars, trucks, motorcycles and off-roading in every way," Kyle Koh, a former classmate and friend, told NPR. "He was always a good guy and a good friend to me," Koh said. "He was really funny and brought a smile to everybody's face." Dingman's aunt, Janet Dingman, described the 21-year-old as "a really fun, energetic and loving nephew," in an interview with the Pasadena Star-News. "We were really proud of him," she added. "I received news of gunfire at Borderline Bar & Grille from a friend. Which was where my brother was hanging out for the night. Me, my dad, and mom raced to the scene. Or as close as we could get. We tried for hours and hours to get in touch with Blake and got no response. At 12:00 this morning I was informed that my amazing brother was taken down by the shooter as well as his good friend Jake Dunham. Blake, I love you so much and I miss you more than you can imagine." "Words cannot describe the pain I am feeling. Last night my life was changed forever," he added. Jake Dunham, 21, was good friends with Blake Dingman, and the two embraced the off-roading scene together, Kyle Koh told NPR. Dunham was at the bar with Blake Dingman. "As an off-roader, Dunham was the gutsy one," the LA Times reported. "He would drive his giant truck, towing a Ford Ranger. It wasn't long before he'd break the truck after all the hard riding." "He always tried to convince people to [let him] drive their car. Everyone knew it was a bad idea, but sometimes they'd do it," Dunham's friend, Michael Moses, told the newspaper. Alexis Dunham, Dunham's sister explained how she learned of his death: "Two nights ago, we were woken up at 1 a.m. to the news that my brother was missing only to find out 11 hours later that he was murdered," she wrote.